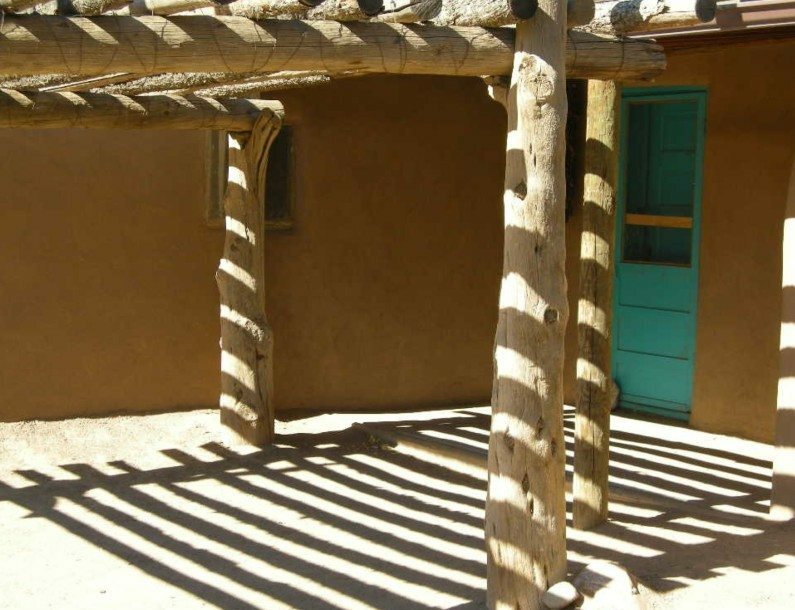 Arbors are a traditional feature of Pueblo life, and they capture the essence of our contemporary existence perfectly. Built by hand of native piñon logs, spaced a few inches apart. Arbor “roofs” were used as drying racks — for plants, for meat, for hides. The structures provide shelter and shadow from the heat of the summer sun, protecting us from dangerous external effects. Yet the design still allows air and light to enter, allowing us room to breathe and grow and adapt to survive. For a people who must walk in two worlds, as Native peoples do today, it is in the shadows and the interstices where our identities live and thrive. Posted on Sunday, June 15th, 2014 at 11:54 am. Filed under: Taos Pueblo: Ancestral Places, Sacred Spaces, The Photography	RSS 2.0 feed.